What would you do with two million dollars? Chances are dim that your first answer would be to build and buy enough liquid sodium to fill a three-meter radius spherical tank. But for some scientists, this investment—the University of Maryland Three Meter dynamo experiment—paid off, serving as a key step to understanding the age-old question of how Earth’s magnetic field is generated. Earth’s magnetic field not only shields us from the sun’s damaging radiation, but also helps us navigate the Earth. Geophysicists have long studied the magnetic field created by Earth’s liquid core, but attempts to re-create them in the lab have previously been unsuccessful due to the prohibitively high costs of building equipment to do so. However, in a study published in January[Physical Review Fluids], a team of Yale researchers in Mechanical Engineering Professor Eric Brown’s lab developed a method for producing liquid metal with improved magnetic properties. The researchers created a protocol to create these Magnetic Liquid Metals (MLM) after studying a suspension of magnetic iron particles in eGaIn, a liquid alloy of indium and gallium. Such a technique could enable researchers to conduct dynamo experiments, which model the generation of Earth’s magnetic field, on a far smaller size scale. By studying earthquakes as they travel through the planet, seismologists know that the Earth has a fluid outer core surrounding a solid iron inner core. The liquid outer core, made of iron, is crucial to creating Earth’s magnetic field and is an example of a magnetohydrodynamic (MHD) phenomenon—magnetic properties resulting from an electrically conductive fluid. Movement of the outer core in the presence of Earth’s magnetic field induces electrical currents, which then create their own magnetic field aligning with Earth’s overall magnetic field. This process sustains itself and allows for the maintenance of Earth’s magnetic field over the years. 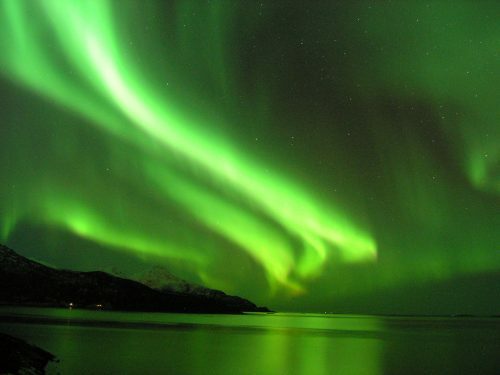 The Earth’s magnetic field is responsible for phenomenon such as the Northern Lights, which occurs when the sun’s radiation is deflected by the magnetic field and collides with atmospheric particles. Image courtesy of Kristian Pikner, Wikimedia Commons. Magnetohydrodynamic phenomena only occur at a high magnetic Reynolds number, which describes the magnetohydrodynamic properties of an object; at a high Reynolds number, MHD phenomena are more likely. The magnetic Reynolds number depends on several properties, such as the system size, the fluid velocity, electrical conductivity, and magnetic susceptibility—the response of the fluid to a magnetic influence. Something as large as a planet would have an extremely high Reynolds number, making MHD phenomena more natural. However, re-creating such phenomena in a laboratory setting is extremely difficult, requiring materials with high magnetic and electrical properties. Traditional studies of MHD have used liquid metals and plasmas because they have the highest electric conductivities of any known materials. 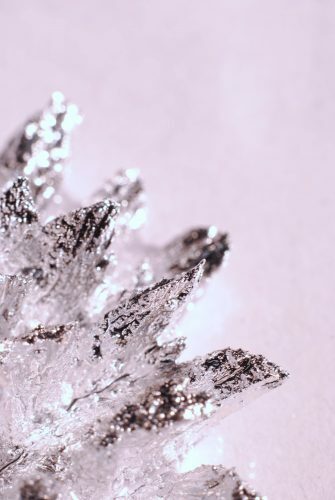 Liquid sodium has the highest conductivity and has been used to create a dynamo experiment in the past, but is both expensive and dangerous; sodium reacts explosively with water and needs to be heated above its high melting temperature. Looking for a safer and easier alternative, the researchers sought to use a different liquid metal base for the study. However, as noted before, other factors such as the magnetic susceptibility also affect the Reynolds number. Despite having a good electrical conductivity, pure eGaIn has a low magnetic susceptibility and therefore a low Reynolds number. To boost the Reynolds number, the researchers proposed creating a new material by suspending magnetic particles in liquid metals to increase their magnetic susceptibility and take advantage of the liquid metals natural high conductivity. While scientists have previously attempted to suspend magnetic particles in liquid metals, they have not been very successful because of metallic oxidation. The oxidation of the metal causes a new “rusted” oxidation layer on the liquid metal, with its own set of properties. As this layer is more solid, it prevents some of the delicate suspension effects. eGaIn shows stronger magnetic properties than liquid sodium. Image courtesy of Florian Carle. Initially, stirring iron particles into the liquid eGaIn failed to create a successful suspension, since a solid oxide layer formed at the surface of the liquid upon exposure to air. Despite vigorous stirring to break the oxide skin, the particles clung to the oxide skin due to the strength of the interactions between the two layers. Seeking solutions to this problem, the scientists used hydrochloric acid (HCl), at a dangerously low pH of 0.69 capable of corroding skin, as a chemical cleaner or purifying agent; in eGaIn, hydrochloric acid removes the oxide layer on the liquid metal and iron particles, allowing for more liquid-like properties in the metal and increasing the conductivity of the iron particles. The suspension process was successful after the researchers added enough HCl to cover the metals and prevent further contact with air. The new material has increased magnetohydrodynamic properties compared to the original eGaIn. The resulting MLM had a Reynolds number over 5 times higher than that of pure liquid metal, or two times higher than liquid sodium. Thus, a dynamo experiment that would previously have required a three-meter radius tank might be possible on a much smaller size scale—10 square centimeters rather than three meters. “Until this study, no one thought about doing dynamo experiments with eGaIn because the quantity needed for these experiments make it cost prohibitive,” said Florian Carle, the lead author of the paper. Furthermore, certain properties of the MLM can be customized for different purposes and different applications. As long as the conductivity of the iron particles you would like to suspend is higher than that of the liquid metal base, nearly any material can be used for the liquid and suspended particles. “It’s basically Design Your Own Fluid…you can suspend silver, graphene, diamond…you can tune the size of the particles within this huge range,” Carle said. Changing the quantity of iron particles in eGaIn will modify the material viscosity—the more particles, the more viscous the fluid. Furthermore, changing the type of particle used can further affect the conductivity and magnetic properties of the material; using highly conductive particles will increase conductivity, and using magnetic particles like iron or steel can increase magnetic properties. The applications are myriad. Separately controlling the viscosity and the magnetic properties of the material will allow scientists to isolate the effects of magnetohydrodynamics, which is indicated by the Reynolds number, and turbulence, a measure affected by fluid viscosity and velocity that indicates how chaotic the flow of the material is. Carle designed the paper to be easily accessible, so that even a scientist without special training could re-create the material. He hopes that more scientists will apply the procedure to their research: “Now that we can tune the properties…hopefully people will start picking up on that and be able to use that. I hope in the near future we will see more and more experiments using MLMs,” Carle said. Though Carle has moved on to work at the Yale Quantum Institute, research continues in the Brown lab on the material. One challenge the group is investigating is in keeping the magnetic liquid metals fresh during storage: after six months of storage, samples exhibited a loss in magnetic susceptibility as the hydrochloric acid slowly ate away at the iron particles. “It’s a bit of a conflict, since you need to protect the eGaIn with HCl, but then the HCl will eat the iron,” Carle said. Further research is being done to develop storage methods for eGaIn, including solidifying the samples or removing HCl to allow formation of a protective oxide layer on the surface of the fluid during storage. Carle further speculates that there are applications beyond MHD and dynamo experiments, since it is a customizable new material. And perhaps an MLM could eventually be created out of sodium, which has the highest electric conductivity of any known liquid metal. Adding magnetic particles to that suspension could allow scientists to attain a Reynolds number off the charts. “You would have a superfluid…maybe we would see phenomena we haven’t seen anywhere before,” Carle said.